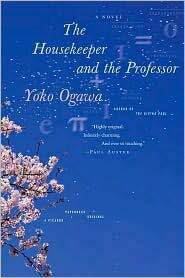 In The Housekeeper and the Professor, Yoko Ogawa tells an intimate story about family, the nature of memory, and the poetry of mathematics. It is also, in a sense, a story about the simple experience of getting to know someone, but with a twist: the person forgets everything in eighty minutes. How do you form a relationship with a person who cannot remember? In this uplifting and often poignant novel, Ogawa seems to ask whether our immediate experiences are more important than our memories, since memories inevitably fade, and the eponymous Professor’s condition of limited short-term memory allows the author to explore this question with great creativity. In The Housekeeper and the Professor, Yoko Ogawa tells an intimate story about family, the nature of memory, and the poetry of mathematics. It is also, in a sense, a story about the simple experience of getting to know someone, but with a twist: the person forgets everything in eighty minutes. How do you form a relationship with a person who cannot remember? In this uplifting and often poignant novel, Ogawa seems to ask whether our immediate experiences are more important than our memories, since memories inevitably fade, and the eponymous Professor’s condition of limited short-term memory allows the author to explore this question with great creativity. At the same time, Ogawa invites the reader into the world of mathematics, using complex equations as a metaphor for the themes running throughout her book. The Housekeeper and the Professor is a rich, multilayered novel that offers much to discuss. Yoko Ogawa‘s fiction has appeared in The New Yorker, A Public Space, and Zoetrope. Since 1988 she has published more than twenty works of fiction and nonfiction, and has won every major Japanese literary award.